This telescope is the largest at the Haute-Provence Observatory (OHP) and for a long time was the largest in Europe. Its mounting was manufactured by Grubb Parsons at Newcastle in the UK. Its total weight is 70 tons and the moving parts weigh 54 tons. The diameter of the primary mirror is 1.93 meters. It was cast in 1937 by the St Gobain Glass Company in France and weighs more than one ton. The primary and secondary mirrors were ground and polished at the Optical Laboratory of Paris Observatory, under the supervision of the astronomer André Couder. The telescope was put into operation in July 1958. The 20-meter diameter dome was built by the Société des Forges des Ateliers du Creusot, which also built the observing ladder and elevating floor. The dome structure is made of steel and the outer double skin of anodized aluminum. The telescope mounting is of an asymetric equatorial type, also called an english-type mounting. The telescope moves about two perpendicular axes where the longest, the polar axis, is parallel to the Earth's rotation axis and the other lies in a plane parallel to the Earth's equator. How is the telescope pointed ? The orientation of the optical axis of the telescope, and thus the pointing direction, is determined by two angles, the celestial equivalents of terrestrial longitude and latitude. The first angle, called the Right Ascension, (measured in hours in the equatorial plane) is the time elapsed between meridian passage of the Spring equinox and of the pointing direction, with one complete revolution corresponding to 24 hours; the second, called the Declination, is the angle (measured in degrees) between the pointing direction and the equatorial plane. The command console in front of you displays these angles and allows pointing the telescope. The accuracy of the pointing has been improved by a computer program which takes into account the different sources of error, in particular that due to mechanical flexure. 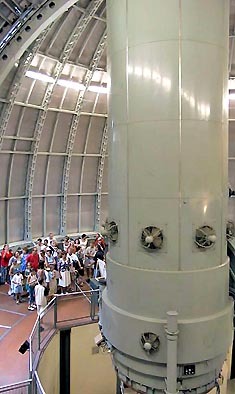 The dome slit opens up and the dome turns around to permit observing in the direction where the telescope is pointing. There are two clocks in front of you: one for Universal Time (UT) or Earth time, and the other for Sidereal Time (ST) or Star time. The UT clock tracks the motion of the Sun relative to the meridian of Greenwich; in France this is the local civil time minus 2 hours in Summer, and minus 1 hour in Winter. The Sun crosses the Greenwich meridian at 12 UT. The ST clock gives the Right Ascension of the stars passing through the local meridian and is thus used to point the telescope. The Earth makes a round trip around the Sun in nearly 365 days, and thus makes 1/365th of the trip on a single day. As the Earth moves in its orbit in the same sense as it rotates around its own axis, it must make an additional 1/365th of a turn every day to keep the same orientation with respect to the Sun as on the previous day. The solar day will thus be longer than the sidereal day by 1/365th of a day, or 3minutes and 56sec. Where is the light focused ? The image formed by the 1.93m primary mirror can be brought to three different foci with the help of auxilliary mirrors, but the only position now used is the Cassegrain focus which lies immediately behing the primary mirror. A secondary mirror, located at the top of the telescope tube, sends the converging beam of light formed by the primary mirror back into the telescope tube and through a central opening in the primary. Focusing the telescope is done by moving the secondary mirror along the optical axis. This allows the mounting at the telescope of different observing instruments, which can be reached thanks to the elevating observing platform. What instruments are in use ? The instruments now in use at this telescope, all designed at OHP and maintained by the local staff, are : Carelec, a long-slit spectrograph equipped with interchangeable diffraction gratings which is used for studies of galaxies and faint stars and Sophie, a high-resolution échelle spectrograph for very precise measurements of stellar radial velocities. Built with financial aid from INSU and the Provence-Alpes-Côte d'Azur Regional Council (PACA), Sophie now replaces Elodie, used in 1995 to discover the first extra-solar planet, around the star 51 Pegasi. In order to achieve the highest mechanical and thermal stability necessary for this type of measurement, Sophie is located in a temperature-controlled room and the light collected by the telescope is transported by an optical fiber directly into the spectrograph. These instruments, which are entirely computer-controlled, are equipped with highly sensitive CCD detectors cooled to liquid nitrogen temperatures (-90°C). Thus our observatory, together with the international observatories to which France participates, fulfills an important research mission in the fascinating science of astronomy.